For EWB, 2016 was full of energy, growth, focus and drive. We’re proud to share with you the summary of our achievements from the year. 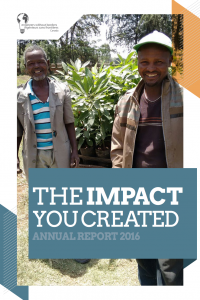 In our 2016 Annual Report, you’ll see that EWB invested in two new promising social enterprises and pushed hard for a Development Finance Institution—which resulted in a win in the 2017 Federal Budget. Our community grew by two chapters, giving us a footprint in all 10 provinces, and we began to work on Indigenous Reconciliation. Your support allowed us to do some incredible things last year and invest in some brilliant people. Meet them and hear their stories in the annual report. Download the report to the right.